Hardware update. 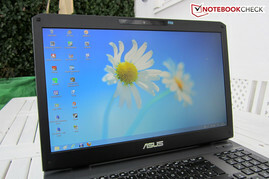 In line with the recent product releases, Asus bestows its 17-inch machine new high-end components. Owing to the modern Kepler architecture, the GeForce GTX 670MX promises more power and a longer battery runtime. We put the G75VX through its paces in this in-depth review. A look at the top 10 chart reveals that only a few desktop replacements accomplish a very good rating of 88% or higher at Notebookcheck. This year merely three gaming laptops could reap in such a score. 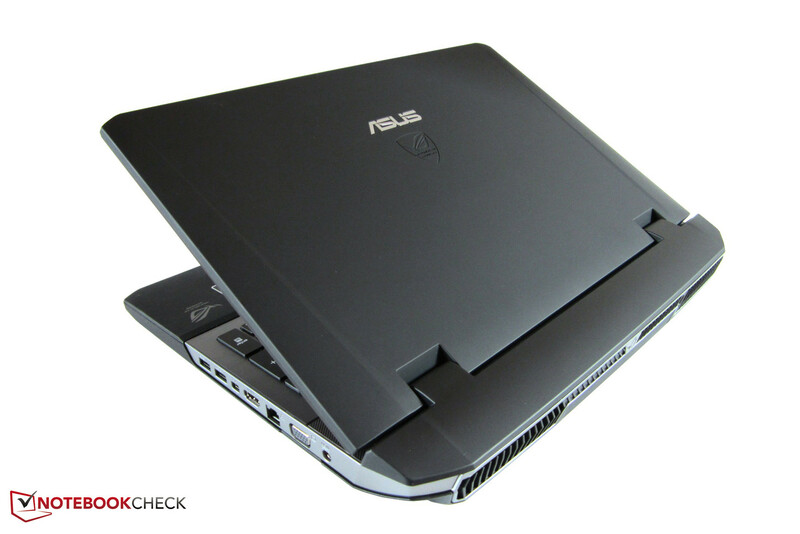 Besides Alienware's M17x R4 and M18x R2, merely Asus' G75VW passed this magical boundary. Although the G74SX's successor definitely has a few faults (no graphics switching, bulky casing), the manufacturer supplies a compelling product. The G75VW not only scores with a top-rate screen and low noise emissions, it also features a backlit keyboard and a generously sized touchpad. The good workmanship and low temperature development are even more assets. 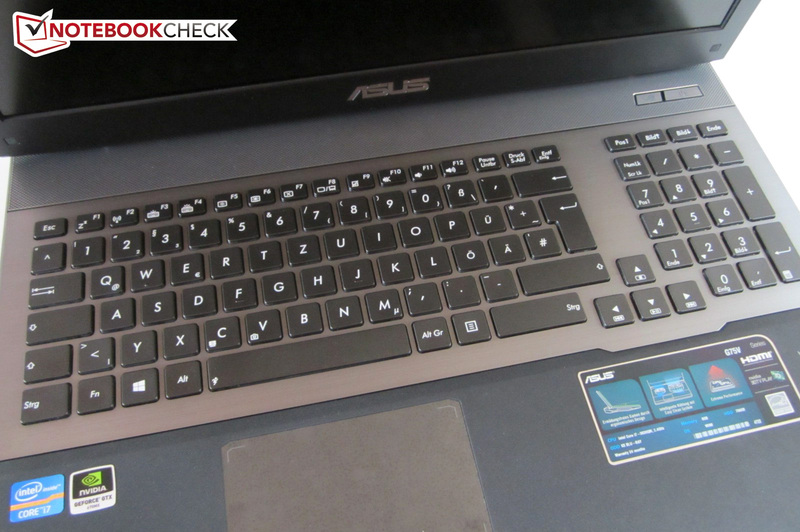 No wonder that Asus primarily focused on the innards of its G75VX. The Taiwanese company, for example, replaced the CPU. Rather than the Core i7-3610QM (2.3 - 3.3 GHz) a somewhat stronger Core i7-3630QM (2.4 - 3.4 GHz) takes care of impending calculations. However, the graphics card is more interesting. 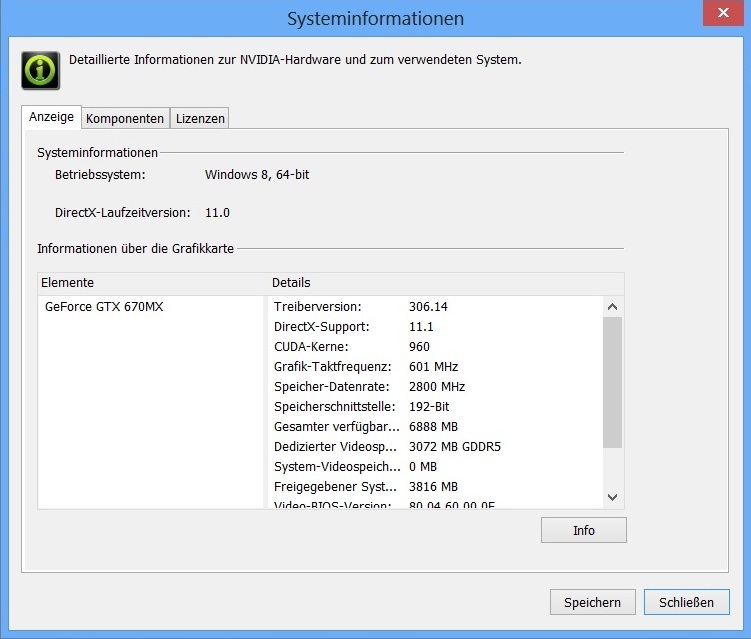 While the GeForce GTX 670M in the G75VW still originated from Nvidia's old Fermi generation, the GeForce GTX 670MX is based on the more efficient Kepler architecture. The smaller build (28 vs. 40 nm) is not unnoticed in power consumption and emissions. We opted for a lower priced model dubbed G75VX-T4020H. 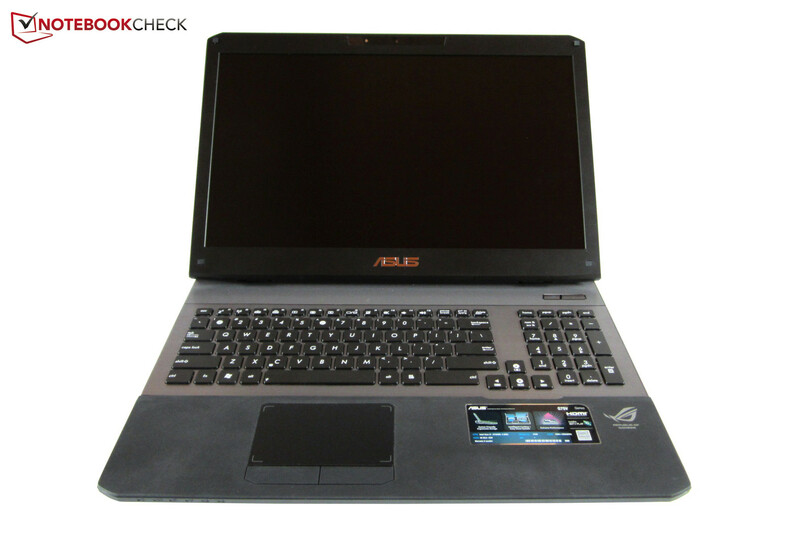 In contrast to the more expensive G75VX-T4014H (~1800 Euros/$2363) and G75VX-CV012H (~2000 Euros/$2626, 120 Hz screen), the test device does not sport a solid state drive. 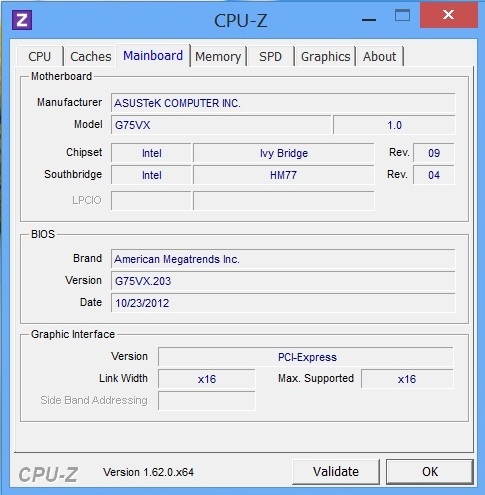 Asus however installs a 750 GB SSH (hybrid model) to meet the premium claim anyway. The devices all have the working memory, drive and operating system in common. The three devices can fall back on eight GB of DDR3 RAM, a Blu-Ray combo (writes CDs & DVDs) and Windows 8 64-bit. Will Asus give a successful performance? Our report summarizes the assets and drawbacks of the 1600 Euros (~$2101) machine. The heavy 4.2 kilogram (~9.26 pound) casing makes a topnotch impression. The above-average quality impression is owed particularly to the keyboard's silver metal tray, which provides a nice contrast to the rest of the laptop. 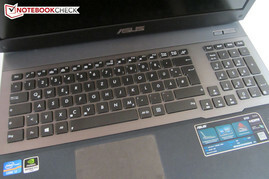 Asus uses black plastic for the display lid and wrist rest as usual. Owing to the soft rubber coating, the surfaces feature a very nice feel. 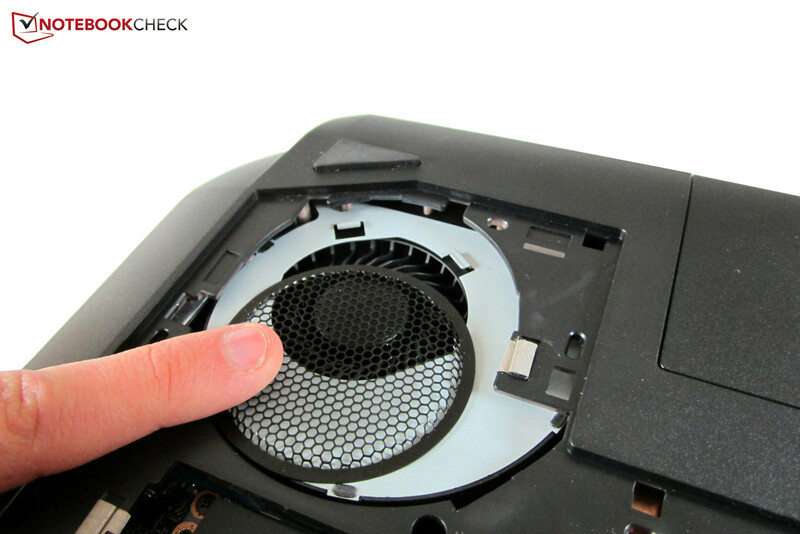 Since the manufacturer does not use any high-gloss parts, the G75VX proves to be quite resistant to smudge. Only greasy fingers leave ugly marks. Particularly MSI (GE60, GX60, etc.) should take an example from this. There is not much room for complaint in terms of workmanship. Almost all parts exhibit a clean transition. 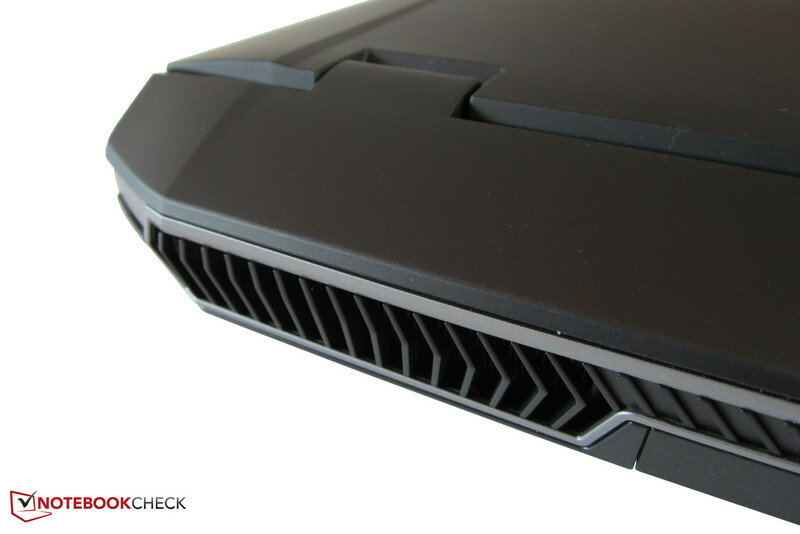 Only Alienware provides a comparable quality standard in the gaming sector. The exclusive design is another unique selling point. The distinctive shape, which is characterized by unique fan outputs and beveled sides, has been continuously modernized since the G73. However, the streamlined looks have drawbacks. Transportation is a bit inconvenient due to the laptop's varying height (3.5 cm/~1.4 inches) and the suboptimal weight distribution (the chassis gets heavier towards the rear). 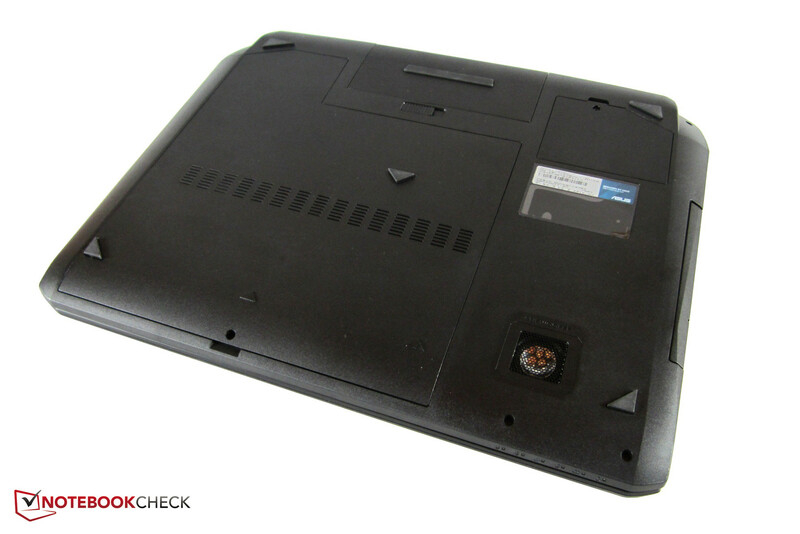 The bulky rear has regrettably been the reason that the G75VX does not fit in every 17-inch case. Not many gamers reach a depth of 32 centimeters (~12.6 inches). Even the dual-CPU P370EM barebone (Schenker XMG P722 & Deviltech HellMachine) are approximately three centimeters (~1.18 inches) shorter. Thus, if you are frequently on the move, you should prefer another laptop. The base unit scores well, at least in terms of stability. 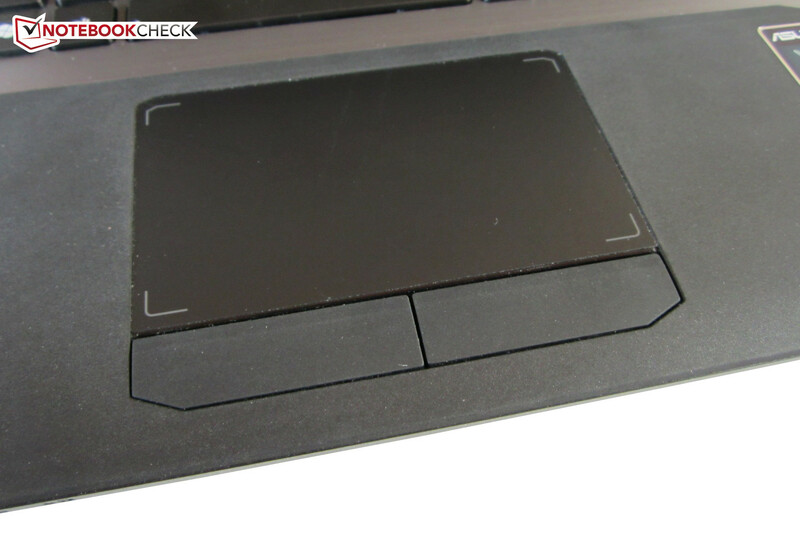 Except for the touchpad, the G75VX even defies higher force. 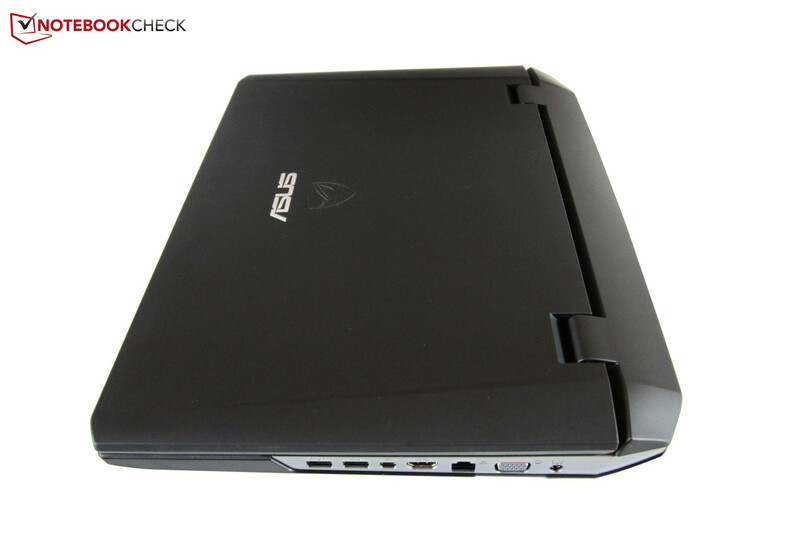 Asus however could still improve the lid. The rubber surface dents extremely in the center. Both hands are needed for opening the lid due to the tightly pulled hinges. The connectivity does not completely justify the premium price. 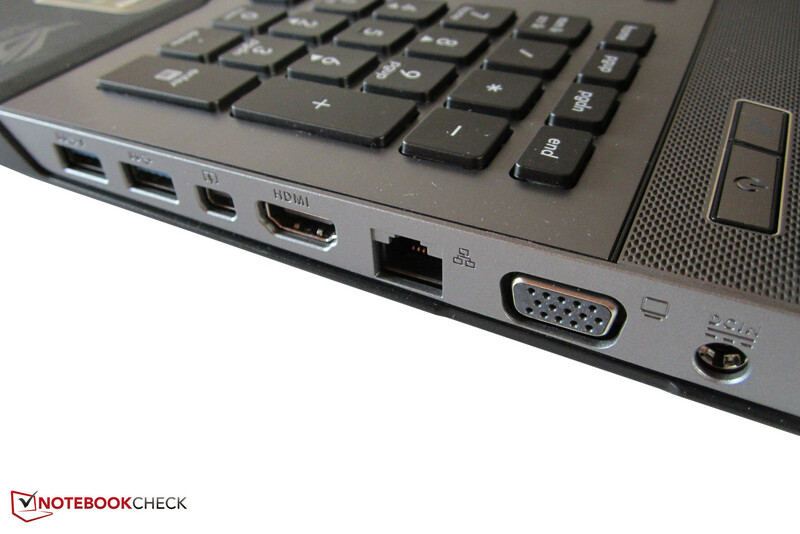 Besides a Firewire and eSATA port, the manufacturer also omits an ExpressCard slot. Some gaming contenders also sport more than two audio jacks. We would recommend the Clevo P170EM barebone (Schenker XMG P702 PRO) or MSI GT70 to owners of a surround system who rely on a jack plug. Apart from that, the G75VX looks good. Four USB 3.0 ports are just as respectable as a Thunderbolt port. Of course an RJ45 Gigabit LAN port, a card reader and a Kensington lock are also installed. External monitors can be connected via VGA or HDMI without an adapter. We deem the port distribution as worthy of improvement. If you connect many cables on the right, you will be aggravated about the limited elbowroom when using a mouse. 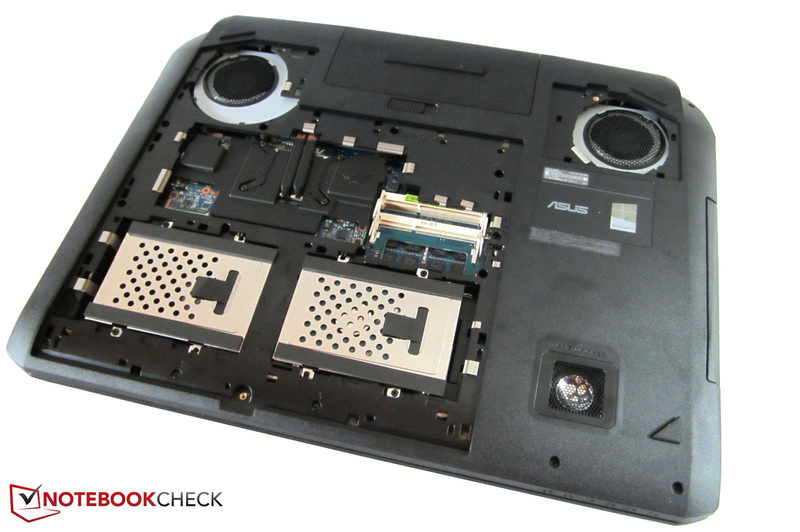 Too bad: Asus still relies on the controversial Atheros AR9485WB-EG Wi-Fi module. 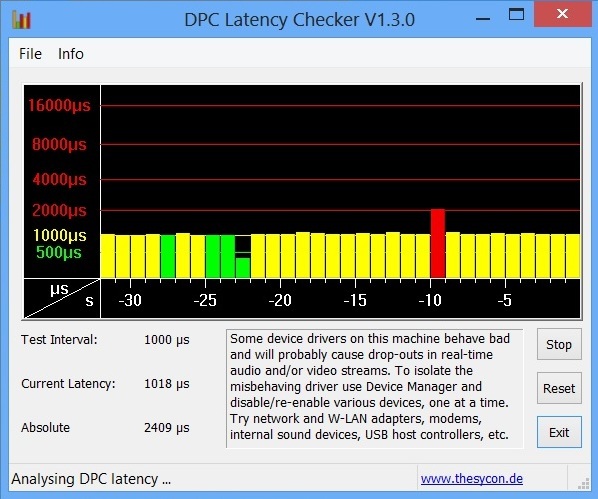 In the past, many users complained about a poor range and connection quality. This circumstance might also be due to the specifications. While other products support 5.0 GHz and transmit data with up to 300 Mbit/s, the G75VX is only capable of 2.4 GHz and 150 Mbit/s. Bluetooth 4.0 support can only compensate this flaw to a part. The limited maintainability is one of the biggest points of criticism. The 17-incher fares well at first glance. Since the base plate is only secured with one screw, it is easy to access the components with a certain degree of effort. 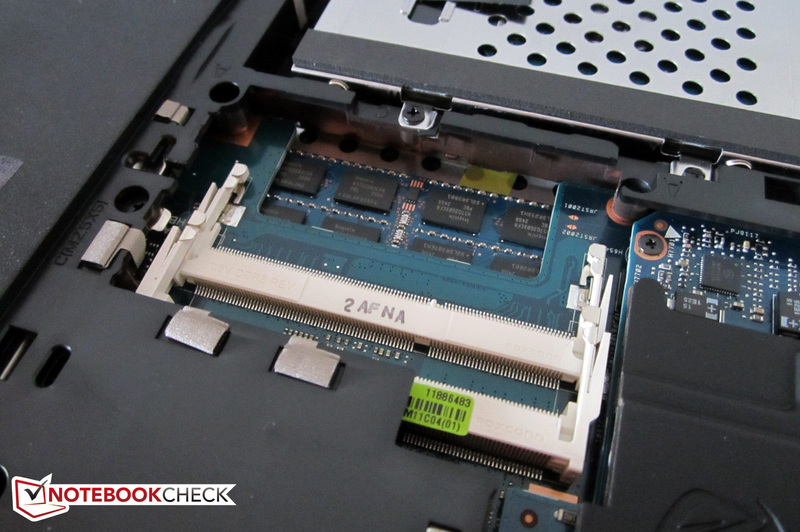 Besides two empty RAM banks (the motherboard theoretically supports 4x 8 GB), two hard disk slots are found underneath the hood. 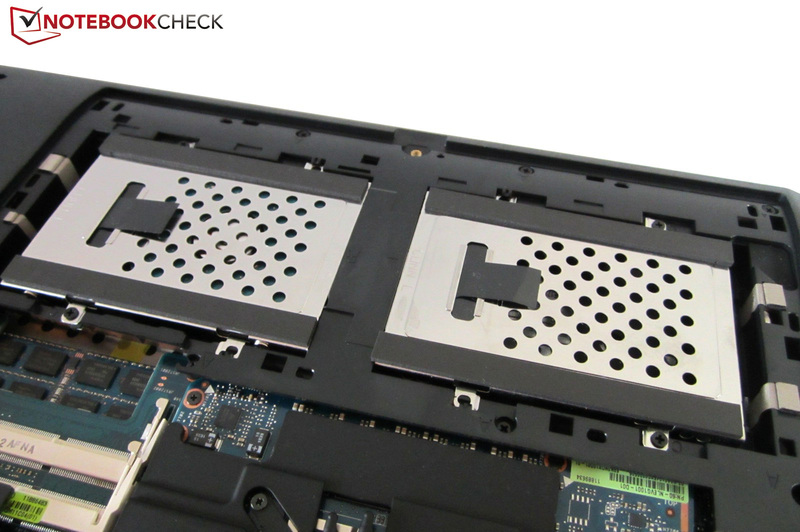 Great: Although the G75VX-T4020H only sports one HDD, every 2.5-inch slot has its own pre-assembled cage. This should make a storage upgrade easy. Talking about memory: the primary RAM banks that are occupied in state of delivery are beneath the keyboard. This situation does not look as good for the graphics card. 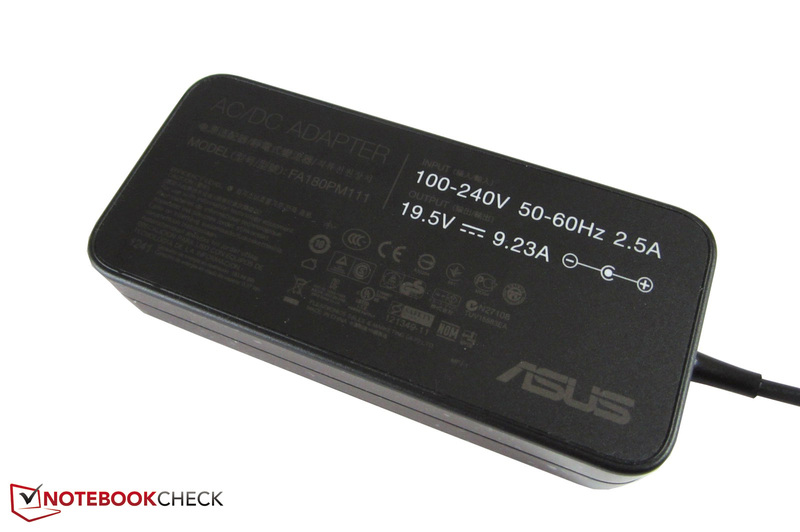 In contrast to other manufacturers, Asus does not use a standard MXM module but a complete in-house design. The GeForce GTX 670M was specially modified for the casing. The graphics card cannot be removed due to the unfavorable cooling construction. Both fans can also only be accessed from their outsides. Non-savvy users cannot at all access the processor. 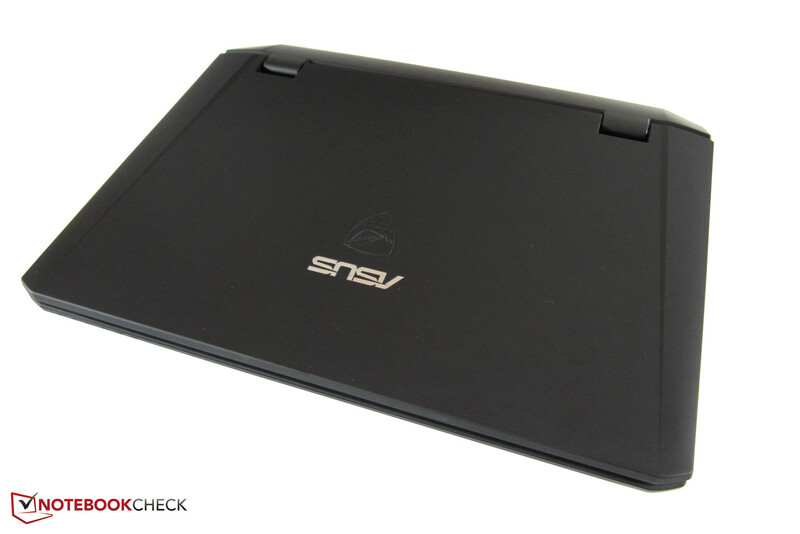 Verdict: Asus should finally follow the example of devices from Alienware, MSI and Clevo. The maintenance possibilities are partly much more extensive among the contenders. As expected, the manufacturer installs loads of software on the laptop. 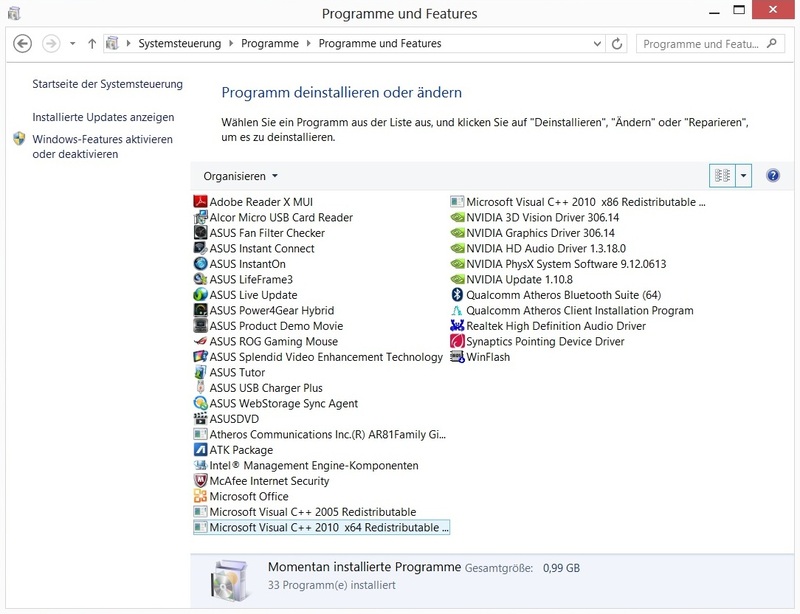 Among the preinstalled programs, we find familiar Asus tools such as Power4Gear Hybrid (additional energy-saving modes), Splendid (optional image enhancements), Live Update (updates a few software components) and USB Charger Plus (takes care of recharging external USB devices). A multimedia player from CyberLink hides behind the arcane ASUSDVD, which can also play Blu-Ray disks. A somewhat outdated ForceWare 306.14 GPU driver runs in our device. 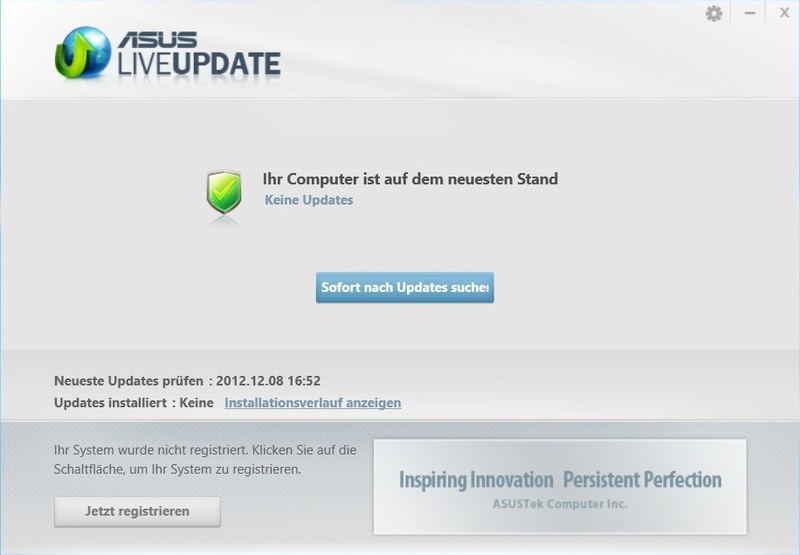 The official Nvidia drivers cannot yet be installed (status: 2012/12/12). Aggravating: Owing to Microsoft's license policy, the casing's bottom does not exhibit a Windows 8 key. The hard disk neither includes a system recovery or a tool for creating such DVDs. An OEM data carrier is not added in the G75VX's box either. At least Microsoft's new operating system has its own recovery feature (see right picture). The accessories will unlikely knock anyone's socks off. 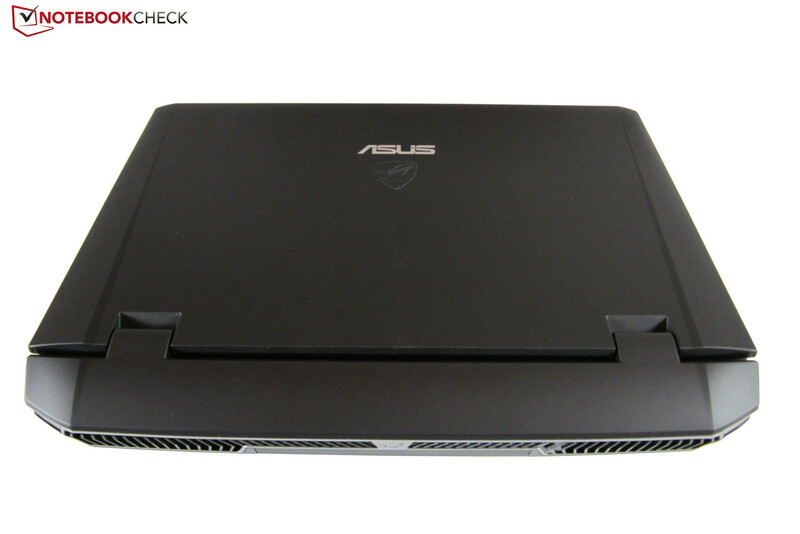 Asus equips the gaming laptop with a driver DVD, a manual, a warranty card, several cable ties and two spare fan filters. The 74 Wh 8-cell battery that is not required for the casing's stability is also included. Great: the G75VW's heavy 860 gram (~1.9 pound) PSU has been replaced by a slimmer and 300 gram (~0.66 pound) lighter model (still 180 Watts). A 24-month warranty is standard in the industry. 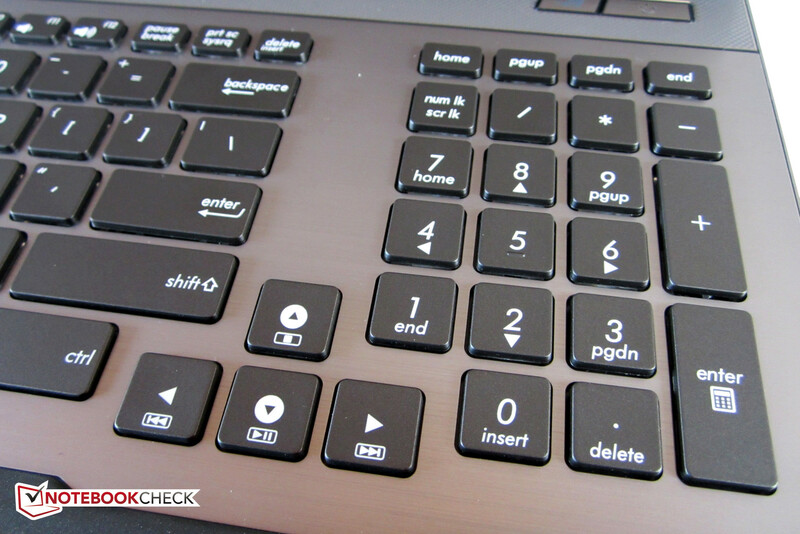 Apart from new symbols, the chiclet keyboard has not been modified. Although the 15 x 15 millimeter (~0.59 inch) keys tend to tilt at the edge and the stroke could be a bit firmer, we would say the keyboard is decent. We particularly liked the beveled edges in addition to the large gaps of a good three millimeters (~0.12 inch). Detached arrow keys and an isolated number pad are also good ideas. Of course, the white backlight is the absolute highlight. Its brightness can be adapted to several levels via an FN combination. That sounds like the perfect feature? Not quite, because the brightness distribution is still not quite ideal. 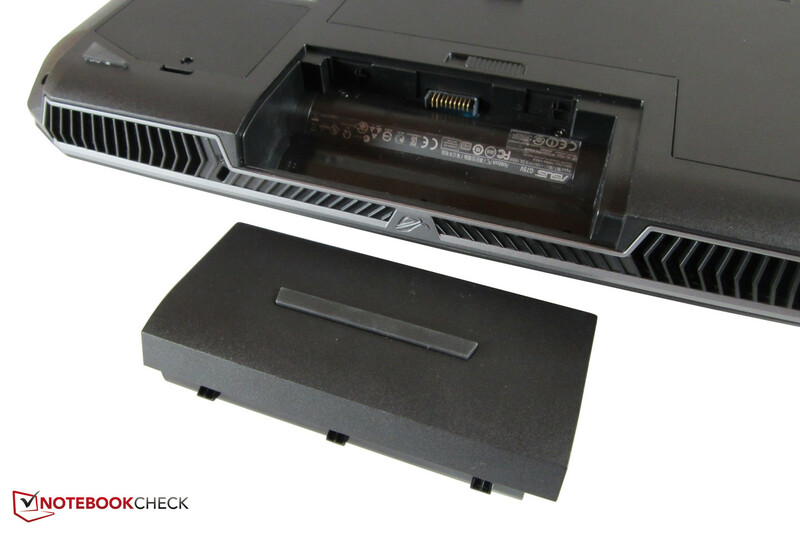 The illumination in Alienware's and Clevo's counterparts is more homogeneous. We would also hope for a bigger color selection in future. The keyboard's noise is in the midfield, i.e. its feedback is neither especially loud nor quite. 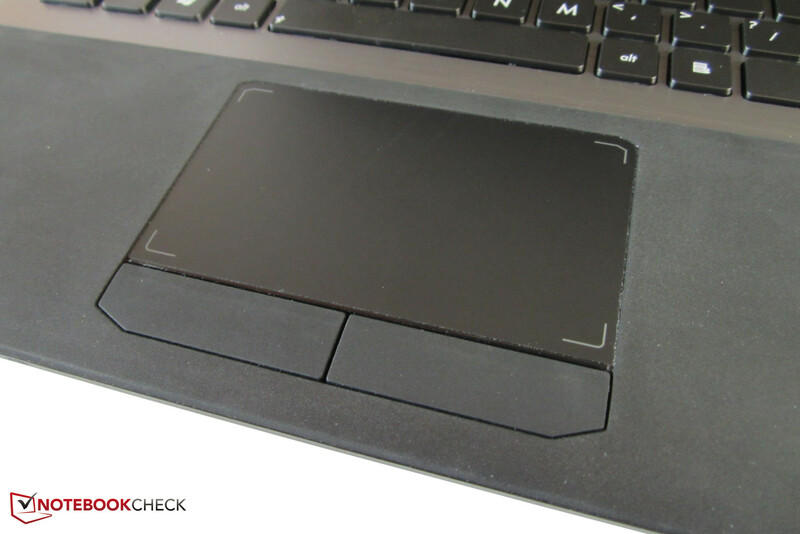 The slightly lowered touchpad strikes with high practicality. On the pro side, the large size would be named among other things. An operational surface of 99 x 56 millimeters (~3.9 x 2.2 inches) is definitely a rare sight. Owing to the above-average size, even long cursor movements can be made without lifting the finger. This and the good gliding traits result in a very pleasant use. We also have to praise the multi-touch support. Multi-finger inputs are usually detected quickly and reliably. In addition to the classic gestures (scroll, zoom, rotate, etc.) the touchpad software explains a few other convenient functions. 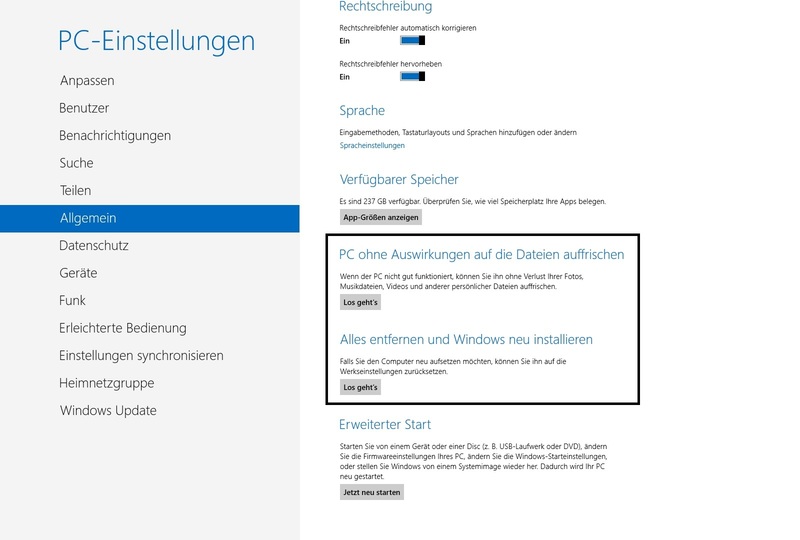 For example, wiping a finger from right to left opens Windows 8's exclusive Charm Bar. Also nifty: the touchpad can be set so that it disables itself when connecting an external mouse. The rubber-coated keys' soft response is a matter of taste. 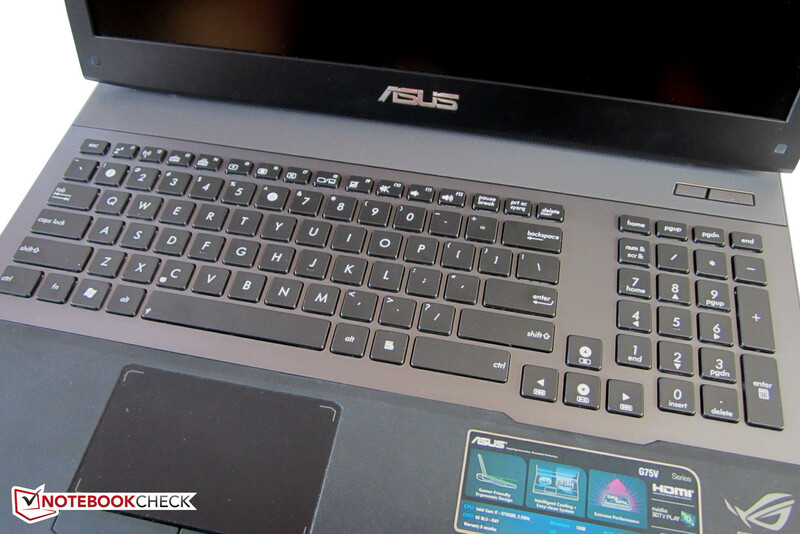 Asus sticks to its line and incorporates a matte Full HD screen model AUO B173HW02 V1. Full HD equals 1920x1080 pixels, so a fairly large desktop. Compared with lower resolutions, multi-window use is much more convenient. Games and movies also benefit from the big screen diagonal. Most gaming manufacturers do not rely on a 17-inch size for nothing. The TN screen's quality only convinces to a part. While the brightness of approximately 265 cd/m² is above laptop average (~225 cd/m²), the contrast lags behind some products from the competition. 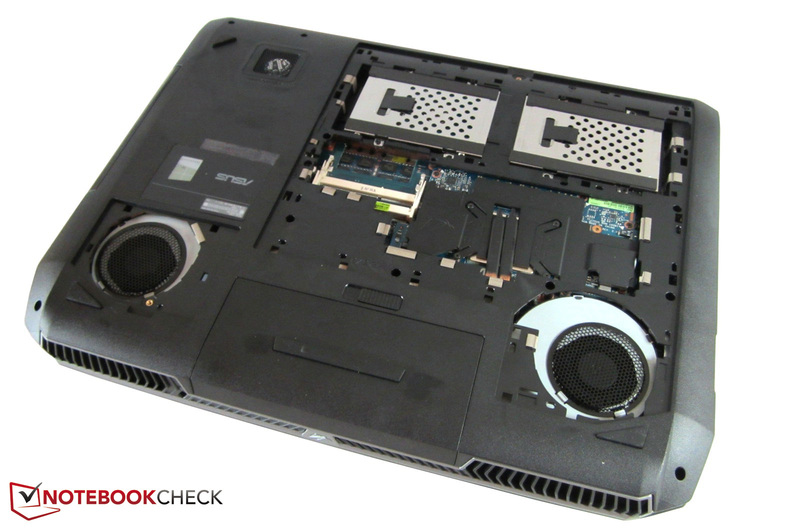 450:1 are not at all bad, but other laptops achieve twice as much. The Chi Mei N173HGE (similar brightness) installed in the G75VW-T1040V achieves approximately 800:1. The rather unsatisfactory score of the G75VX is explained with the second-rate black value. 0.6 cd/m² is the reason for a light gray cast in darker sequences. For comparison: The aforementioned Chi Mei N173HGE manages a much better 0.3 cd/m². 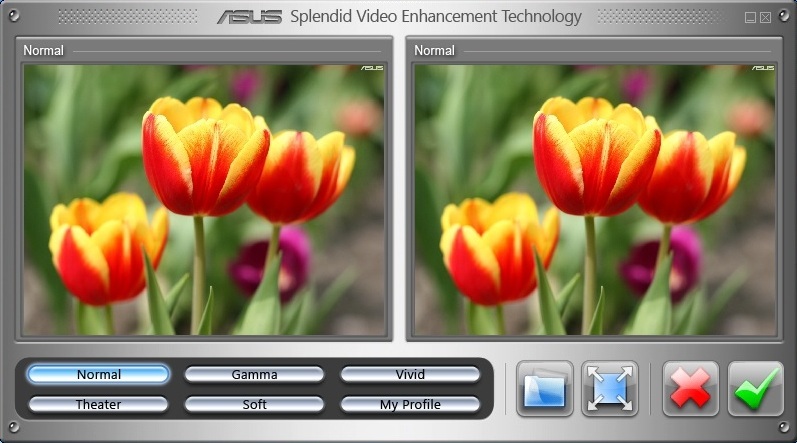 Both models are on a similar level in terms of color reproduction. 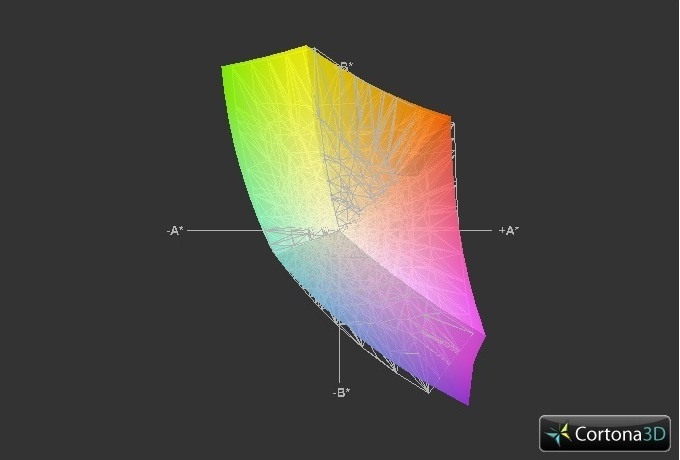 Like most TN screens, the AUO B173HW02 roughly covers the sRGB color space. The screen is beyond reproach in outdoor use. 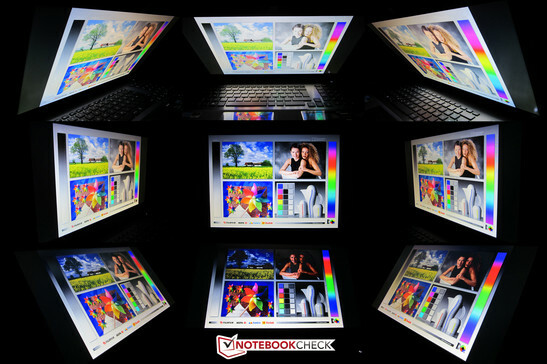 The good brightness and matte surface ensure a flawless reproduction. Texts even remain legible on brighter days. The viewing angle stability is regrettably not very awe-inspiring. Image changes are soon seen when tilting the screen back or forth. A certain brightness gradation can sometimes be observed even from an ideal angle. The content remains more stable on the Chi Mei N173HGE. In return, the screen tolerates larger deviations. To prevent misunderstandings: The majority of buyers will be happy with the screen despite the mentioned drawbacks. 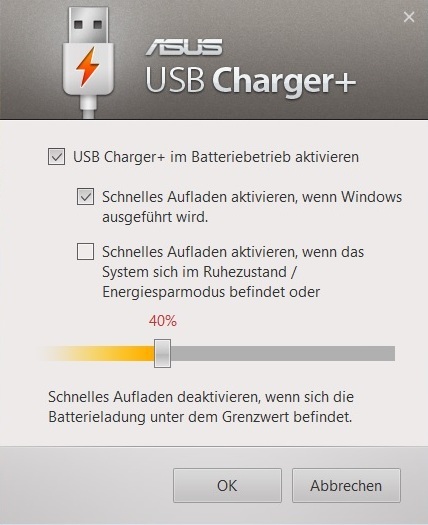 Common screens like often found in less expensive office and multimedia laptops (e.g. Samsung's 350V5C) do not stand a chance against the AUO B173HW02. 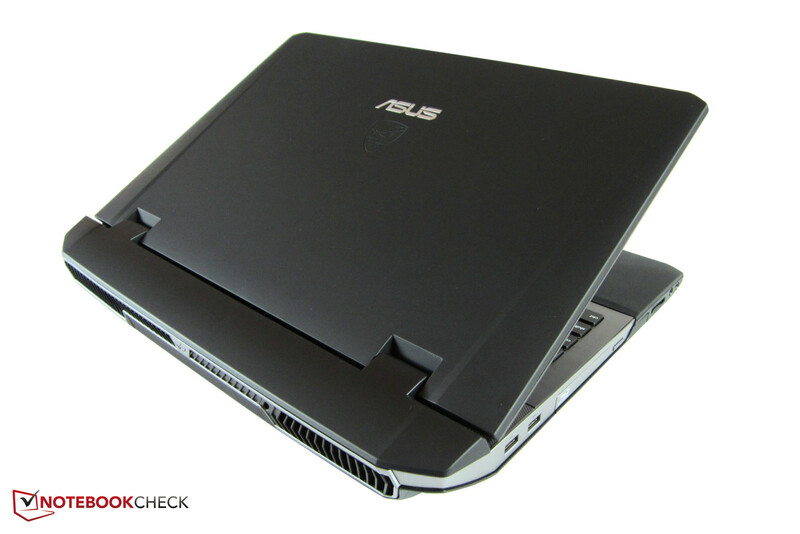 Unsurprisingly, Asus opted for the Core i7-3630QM. 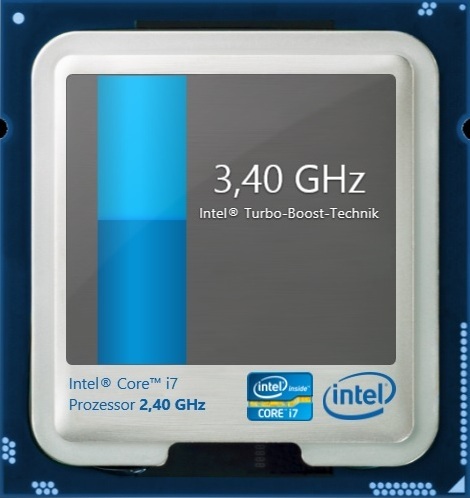 The fast 2.4 - 3.4 GHz quad-core processor comes from Intel's latest Ivy Bridge generation and is built in a modern 22nm process like its Core i3 and Core i5 family members. 1.4 billion transistors and a six MB L3 cache correspond to the 100 MHz lower clocked Core i7-3610QM. 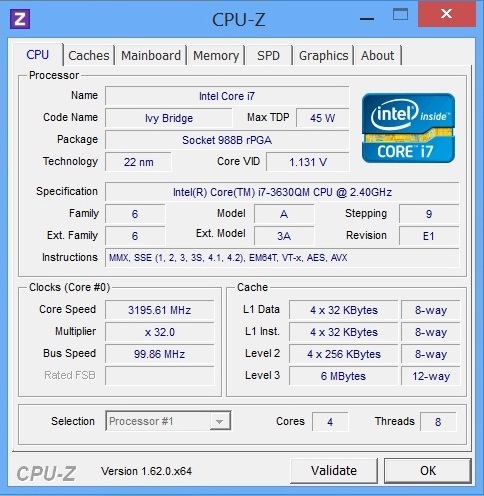 The high-end model can simulate four virtual cores via Hyperthreading. Thus eight parallel threads are possible on four physical cores. Turbo Boost is responsible for automatic overclocking. Buyers who were expecting to find Nvidia's Optimus technology in the G75VX will regrettably be disappointed. 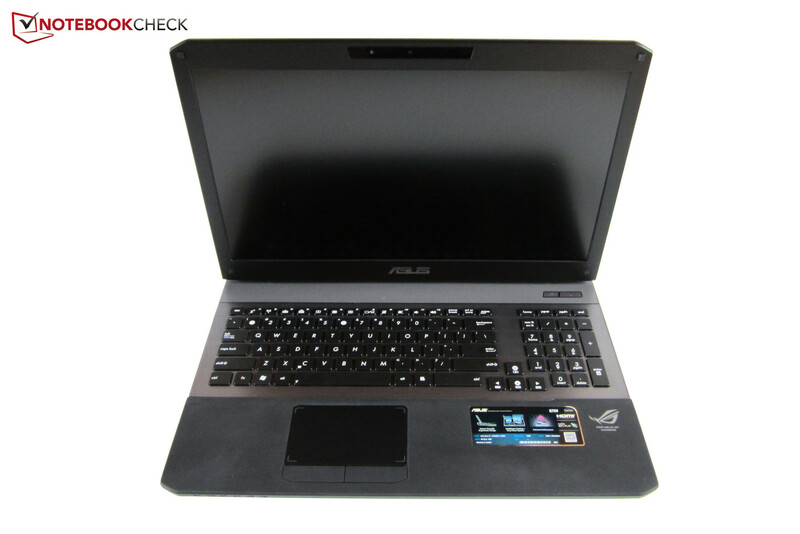 Asus does not implement graphics switching in its newest model either. The processor-integrated HD Graphics 4000 chip is always disabled. The reason for this is that manufacturers have to connect the screen with the dedicated graphics card in order to offer 3D capable models and Optimus does not yet support 3D Vision. 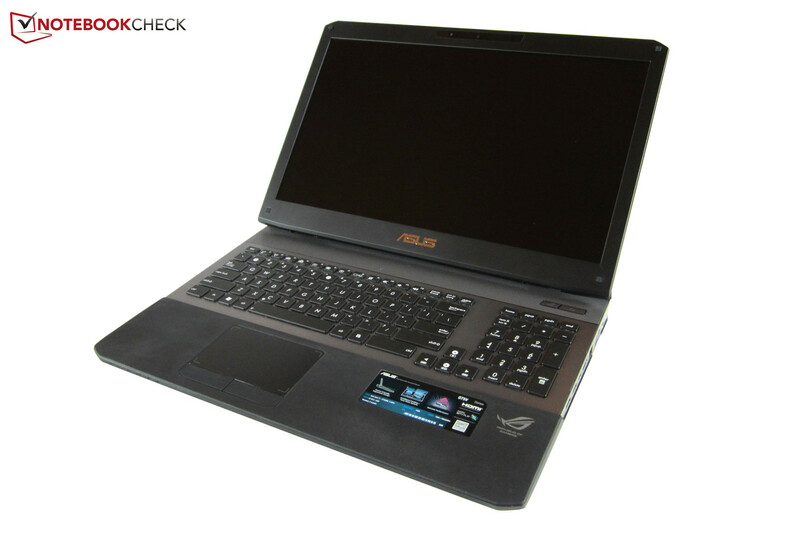 The screen is usually connected to the integrated graphics unit in laptops with GPU switching. Asus likely shies away from the higher development and production effort at the expense of battery runtime. As our screenshots shows, the Turbo Boost technology almost always runs at its limit. 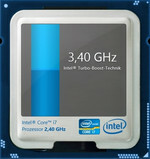 Depending on the core load, the quad-core settles to between 3.0 - 3.3 GHz. 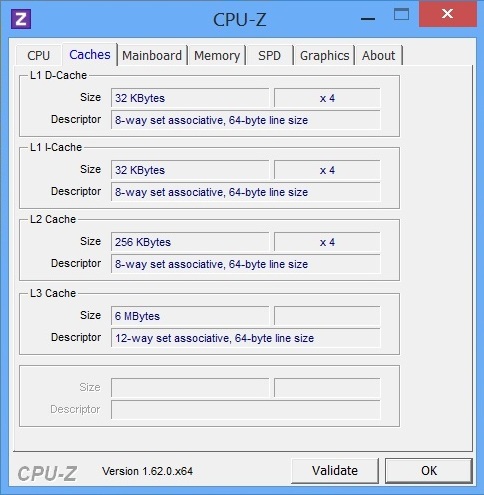 The CPU deserves approval because it breaks the 3 GHz mark even in full load. The cooling system appears to be designed sufficiently. The G75VX only has a slight advantage over the old model in processing. 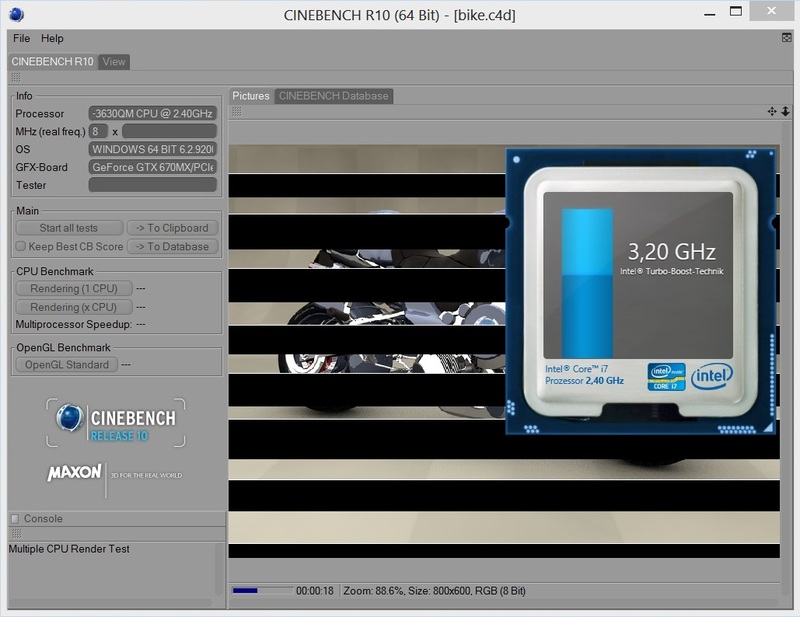 With 6.42 points in Cinebench R11.5 multi-core rendering, the Core i7-3630QM only has a 4% lead on the Core i7-3610QM (6.15 points @Asus G75VW-T1040V). 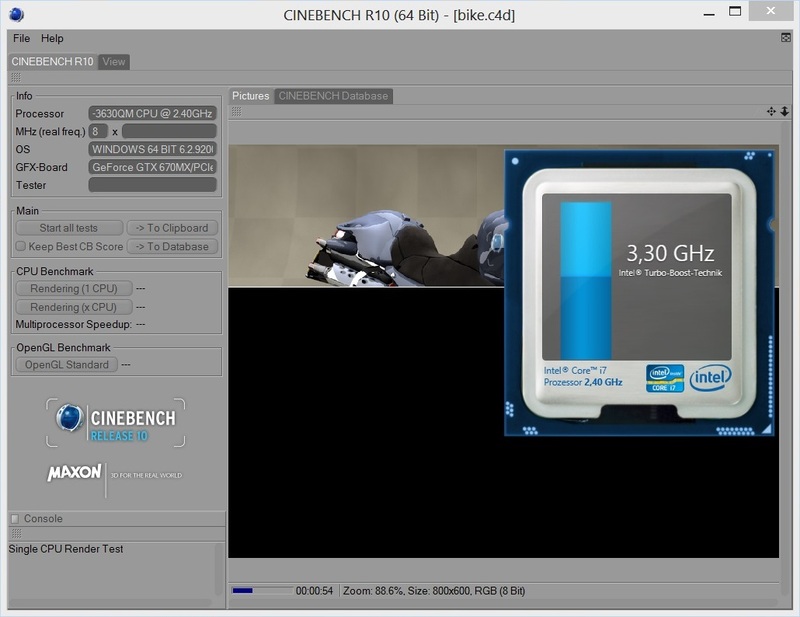 The difference is just as slim in Cinebench R10 (see chart). Regardless of the benchmark results, the Ivy Bridge architecture provides a high future security. The processor will unlikely find its limits in the next few years. It is usually due to the graphics card when games stutter. Asus finally uses an energy-efficient Kepler model as the graphics card. The GeForce GTX 670MX is a high-end GPU from Nvidia and is built in a modern 28 nm process (Fermi generation: 40 nm). 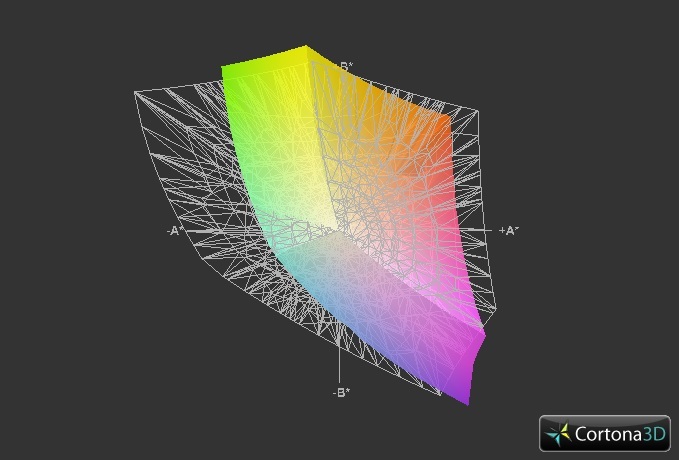 960 Unified Shaders and 3072 MB of GDDR5 VRAM are quite lush. However, the specifications cannot compete with Nvidia's premium model. The GeForce GTX 680M encompasses 40% more arithmetic units (1344 CUDA cores) and a large 4096 MB video memory that is connected with 256 rather than 192 bits. The clock rates also differ. 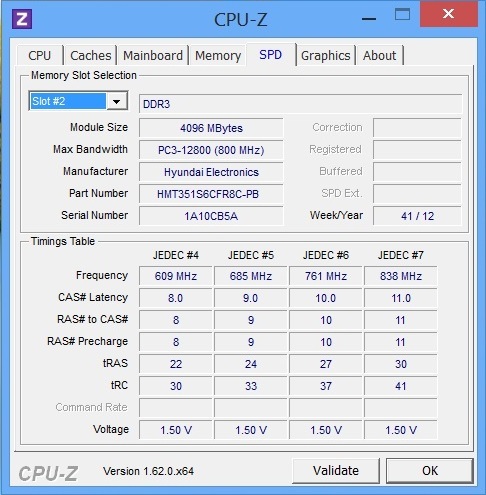 Instead of 720/1800 MHz (core/memory), the GTX 670MX is only clocked with 600 and 1400 MHz respectively. 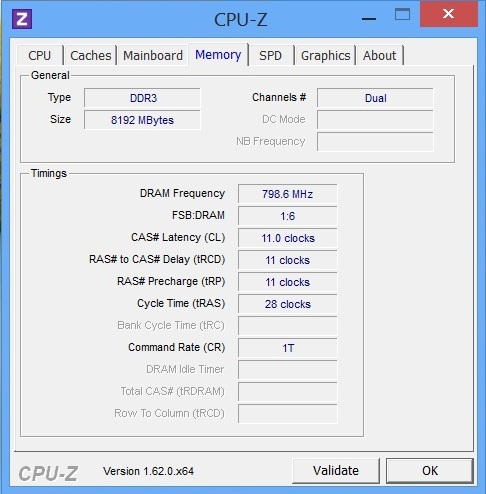 Even the old GTX 670M Fermi model ran with a slightly higher 620/1500 MHz. Can the G75VX nevertheless excel its precursor? 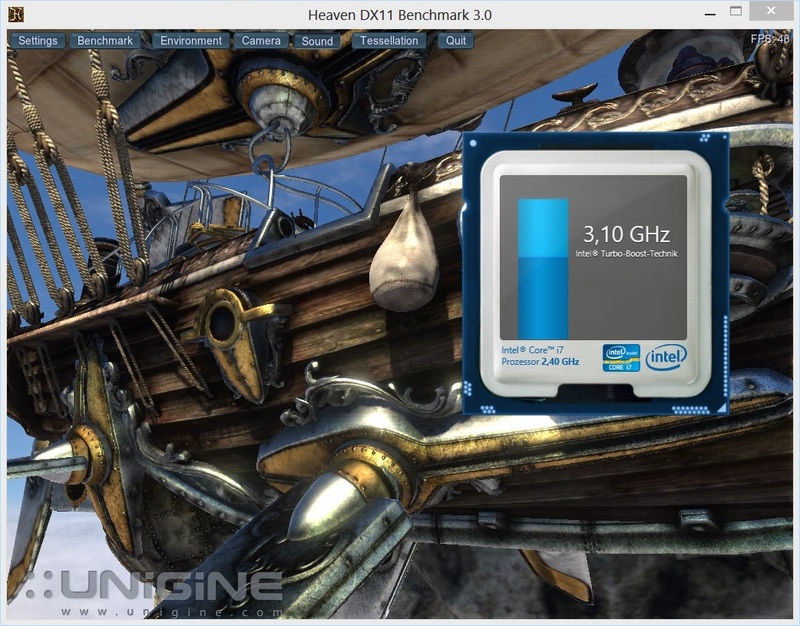 DirectX 11 benchmarks, such as 3DMark 11, disclose the true potential of the Kepler architecture. The 17-incher's 3567 points achieved in the performance preset (GPU score) not only show the GeForce GTX 670M (2703 points @Asus G75VW-T1040V) its place, but also the GeForce GTX 675M (3218 points @Samsung 700G7C). 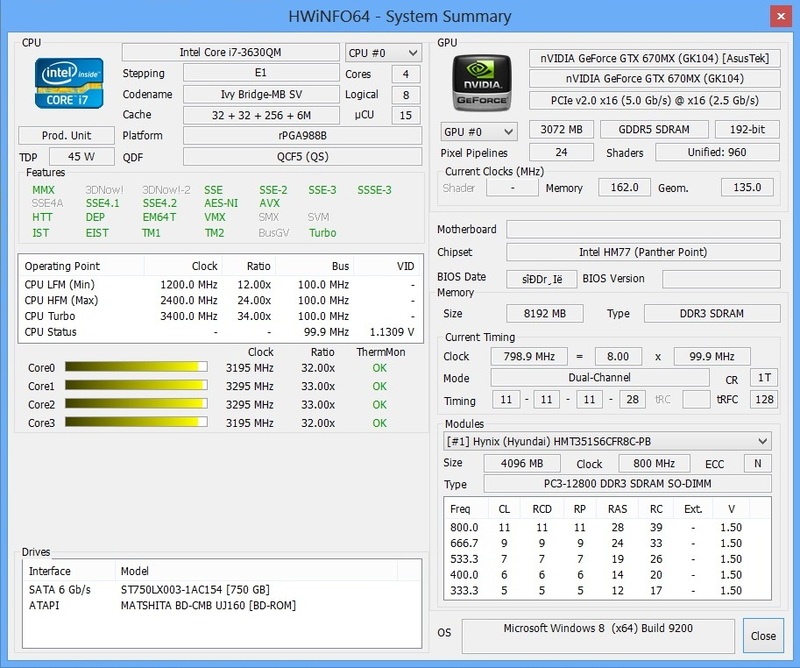 The GeForce GTX 675MX calculates over 10% faster (3998 points @One M73-2N). The GTX 670MX also clearly surpasses the GTX 670M in the Unigine Heaven 3.0 benchmark. 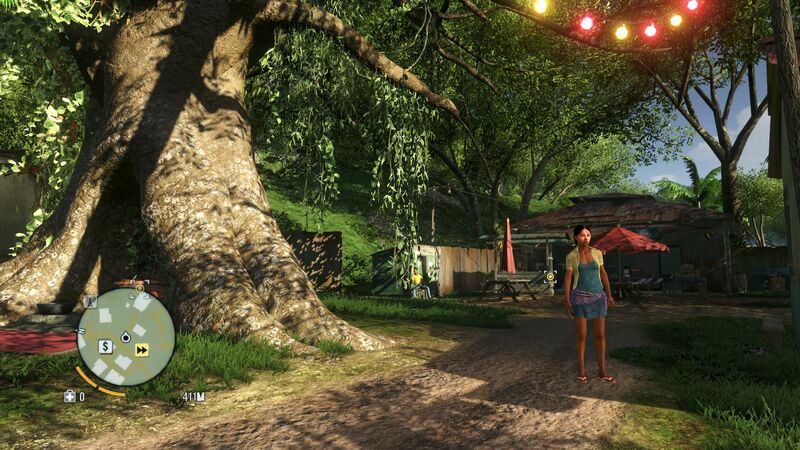 With 34.3 to 27.6 fps (1920x1080, high, default tessellation), the advantage is approximately 25%. 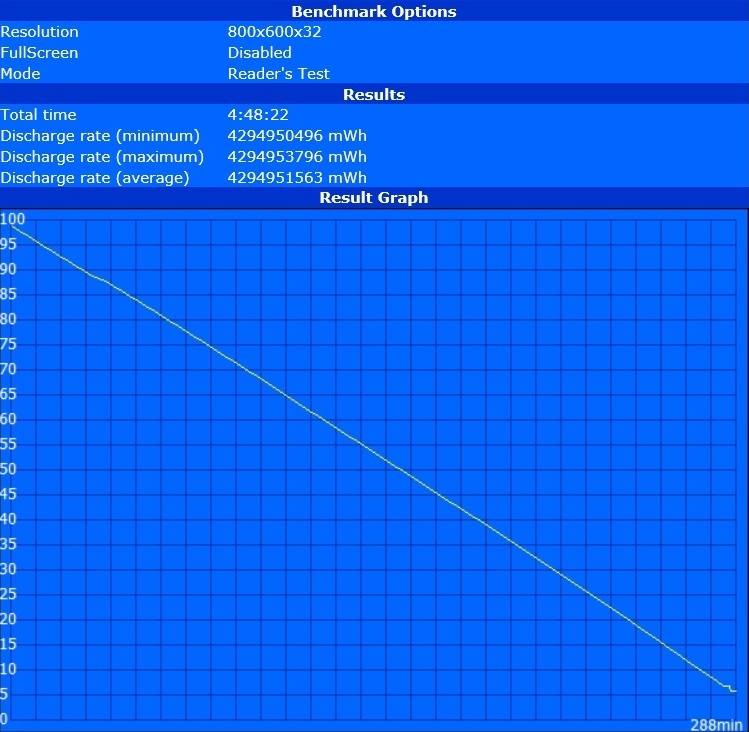 The Kepler model does not quite reach the GTX 675M's result (34.7 fps @Schenker XMG P502). 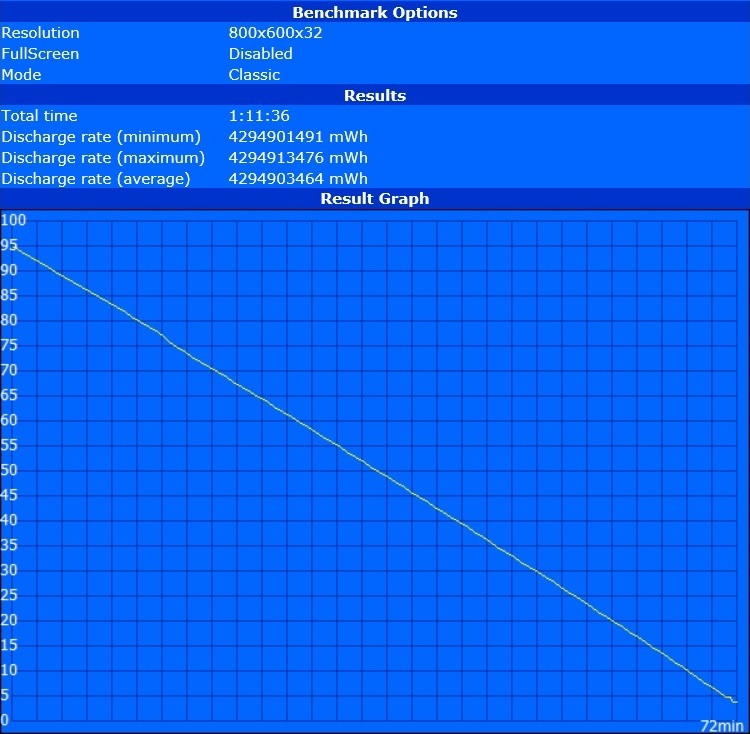 The GTX 675MX settles to a higher 20% with 40.9 fps (Schenker XMG P502). Seagate's Momentus XT ST750LX003 is a hybrid hard disk that fuses a conventional magnetic storage (750 GB @7200 rpm) and a modern flash memory (8 GB). As the practical test shows, the SSH technology does have advantages. In contrast to conventional HDDs, installation, boot, load and transfer times are partly noticeably shorter. 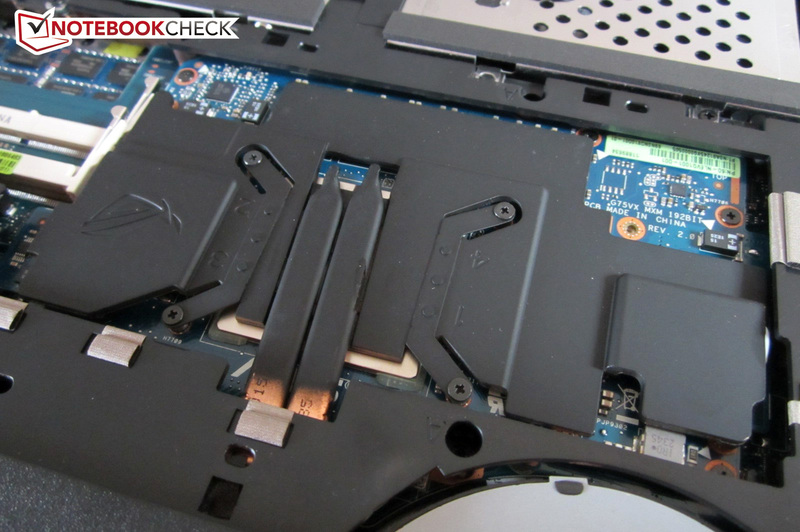 It sometimes almost seemed as if a full-blown SSD was installed under the hood. The emphasis is on "almost" here because, despite the above-average performance, Windows would seem even swifter with a real solid state drive. Since the second hard disk slot is unoccupied, it is possible to upgrade the storage capacity whenever you like. The SSH does not show any weakness in the CrystalDiskMark test. 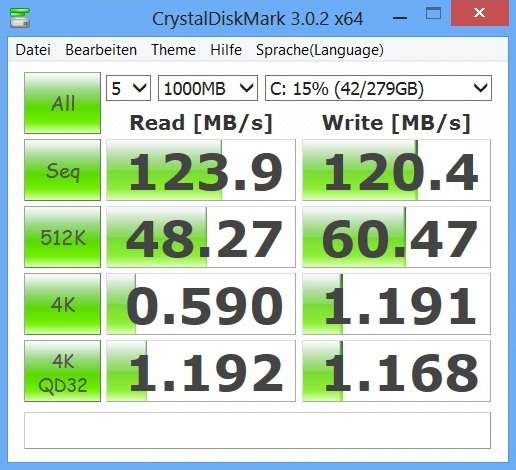 Most HDDs cannot achieve a sequential read rate of 124 MB/s and a sequential write speed of 120 MB/s. Samsung's 1000 GB Spinpoint M8 (Asus G75VW-T1040V) is one of the few exceptions. The system's power can compete with the high-end contenders. 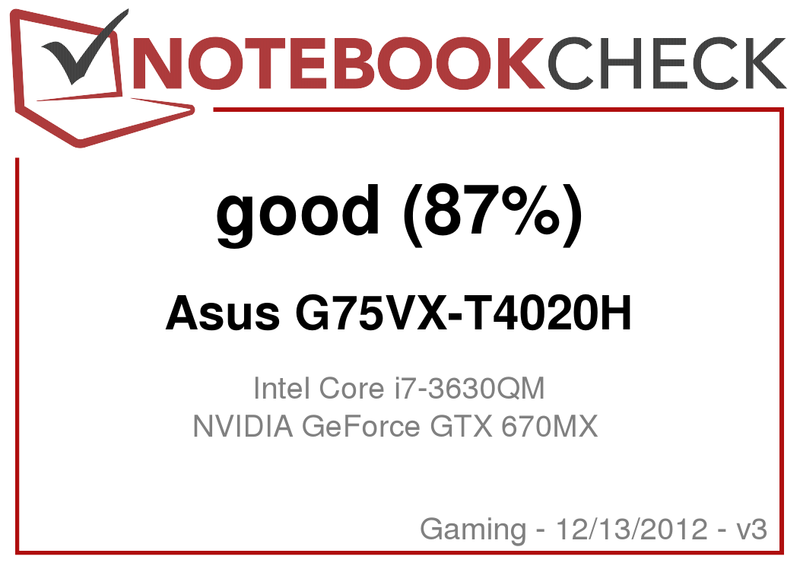 With 4541 points, the G75VX-T4020H just surpasses Deviltech's Devil 6700 (4522 points) in PCMark 7. 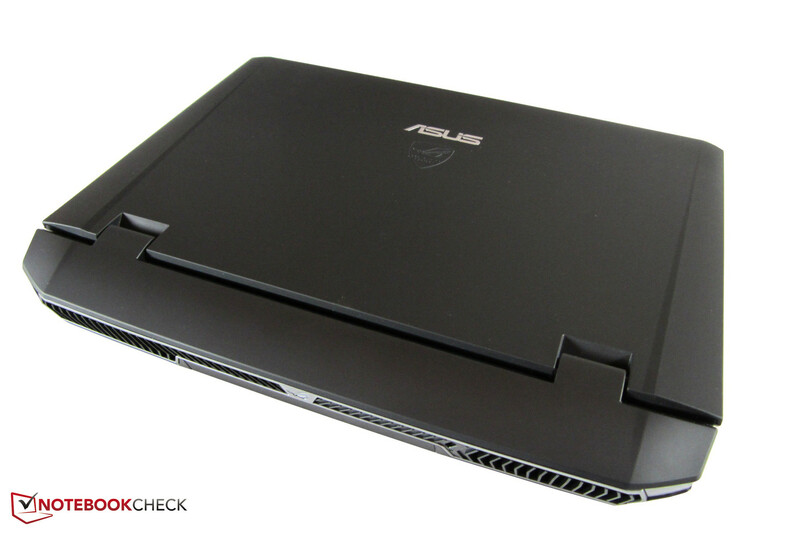 The Devil was powered by a Core i7-3610QM, GeForce GTX 680M and a 120 GB SSD in the test. The GTX 670MX's gaming performance is rather mixed. First the good news: Undemanding games are no problem for the Kepler GPU even in the native resolution. Half of the tested games managed our ultra-setting (maximum details, multiple anti-aliasing) with over 30 fps. These included some audience favorites, such as Dishonored, Skyrim, Borderlands 2 and Black OPS 2. The bad news: Computing-intensive tracks only run smoothly in reduced settings. 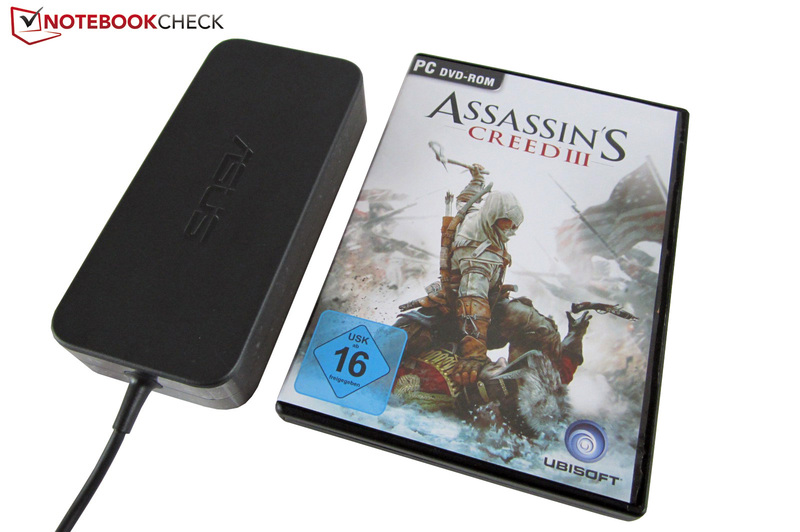 In particular, blockbusters released in late 2012 like Far Cry 3, Assassin's Creed III, Hitman: Absolution and Need for Speed: Most Wanted have high requirements on the G75VX. The graphics card is not ideal for Guild Wars 2, Sleeping Dogs and Battlefield 3 either. The user occasionally has to be satisfied with 1600x900 pixels (the screen interpolates quite well), high details and 2x anti-aliasing. However, users willing to accept compromises should be adequately equipped for the next 1 - 2 years. The GTX 670MX surpasses its GeForce GTX 660M Kepler brother by approximately 15%. The GTX 675M (+20%) and GTX 675MX (+35%) are no threat for the graphics card - unlike in the synthetic DirectX 11 benchmarks. Surprisingly: The older GTX 670M performs on the same level. The 17-incher inherits one of the biggest assets of the G range: The relatively low noise development. 42 dB (A) during full load might sound like a lot, but most gaming laptops surpass this rate in "normal" 3D applications (including games). 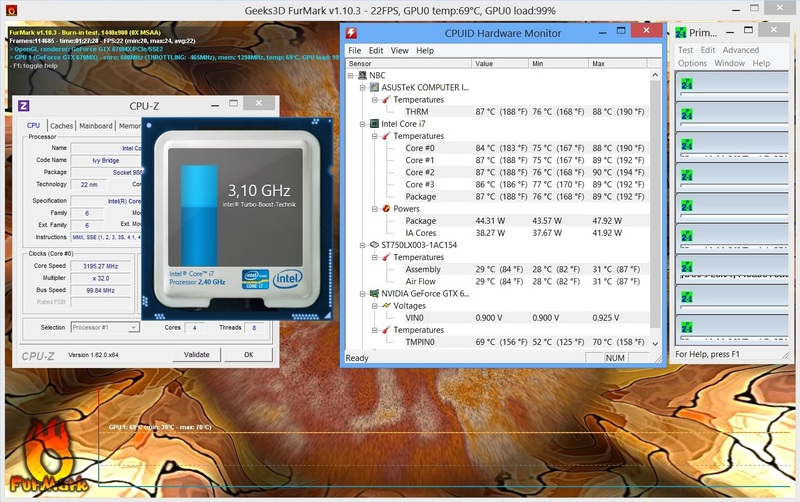 The G75VX's fans spin with merely 37 dB (A) in 3DMark 06. 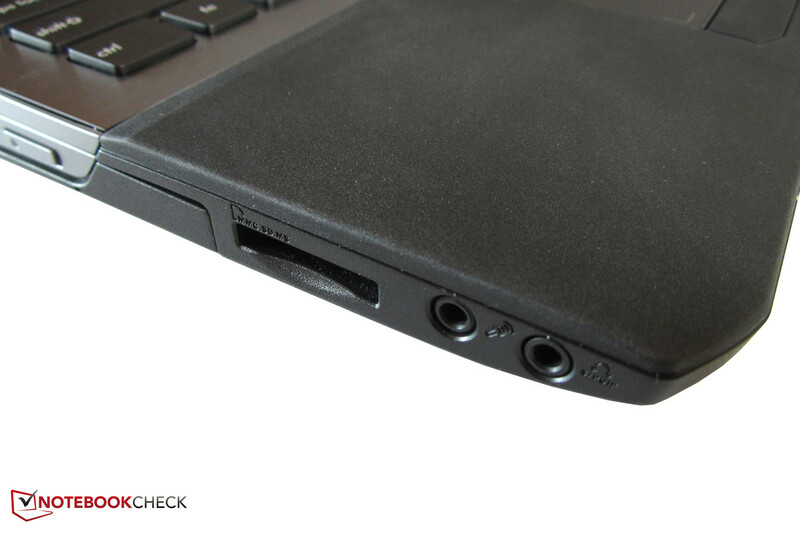 Even weaker premium laptops, such as the One K73-2O, easily reach over 40 dB (A) here. However, the manufacturer could still improve the characteristics. Firstly, the speed sometimes makes an inconsistent impression (slight rattle). Secondly, the fan produces a fairly high noise during load. The cooling seemed louder than our measurements displayed. The fan noise would have to be a bit lower in pitch in order to achieve a very good rating in this category. The optical drive does not work flawlessly either. The Blu-Ray player sometimes reached 39 dB (A) when playing a disk. An annoying whir joins the very audible base noise, but disappears after a while. The hard disk's constant noise is audible in idle use. 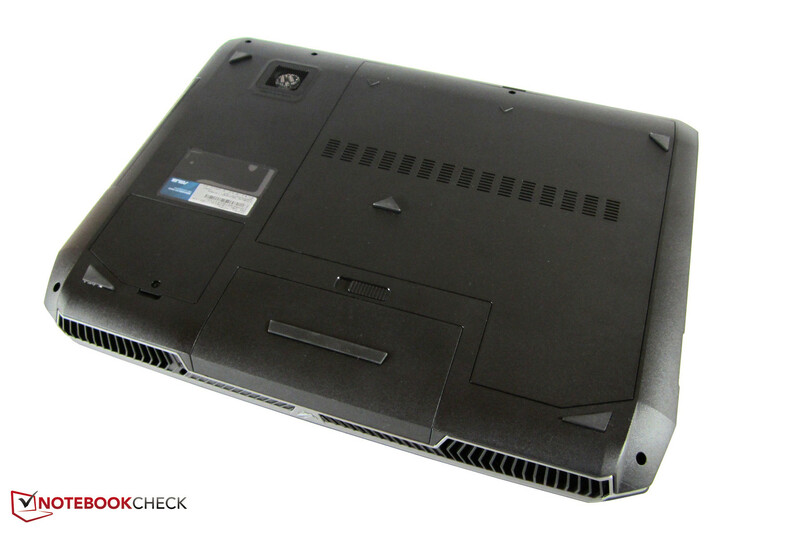 Like the G75VW-T1040V proves, the 17-incher runs quieter with an SSD. Asus' laptop is first-rate in terms of temperature development. While other casings reach temperatures of over 30 °C (86 °F) only in idle (e.g. Toshiba's Qosmio X870), the G75VX stays remarkably cool even in extreme conditions. Around 28 °C (82.4 °F) after one hour of stress testing and 25 °C (77 °F) after two hours of idling is proof of excellent cooling. 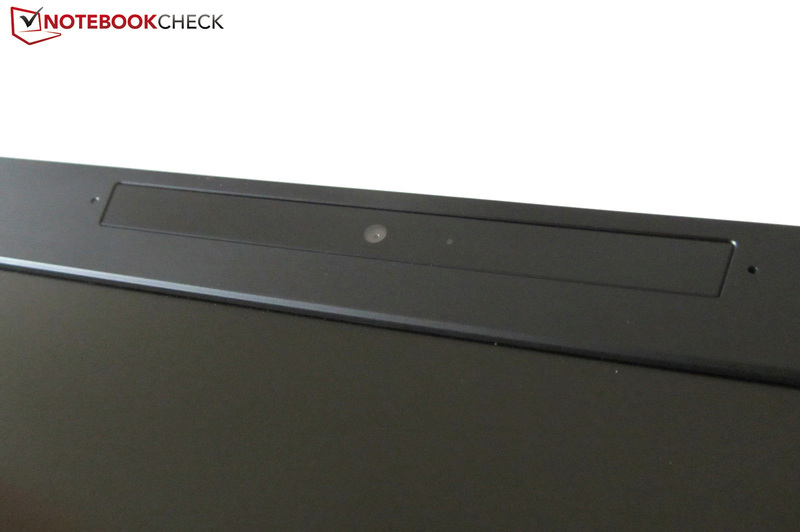 The surfaces on the G75VW got a few degrees warmer (higher room temperature). The components are also within acceptable range. The GPU's maximum temperature of 70 °C (158 °F) and the hard disk's maximum of 31 °C (87.8 °F) do not give reason for complaint. Merely the Core i7-3630QM steps a bit out of line with up to 90 °C (194 °F). Since the laptop will rarely be put under such a load in routine use, this rate is not alarming. (+) The average temperature for the upper side under maximal load is 27.8 °C / 82 F, compared to the average of 32.9 °C / 91 F for the devices in the class Gaming. (+) The maximum temperature on the upper side is 31 °C / 88 F, compared to the average of 39.3 °C / 103 F, ranging from 21.6 to 68.8 °C for the class Gaming. (+) The average temperature of the palmrest area of similar devices was 28.7 °C / 83.7 F (+3.2 °C / 5.8 F). The sound problems still unfortunately exist. Like in the G75VW, the sound seems to only come from the subwoofer and not from both speakers, which are located above the keyboard. Consequently, the sound experience is quite lopsided. Basically, it is incomprehensible why the sound quality has worsened since the G74. Games, movies and music sound a bit tinny and muddy. At least the maximum volume is pretty high. If you value good sound, MSI will be right for you. The GT70 impressively proves that even laptop speakers can produce good results. 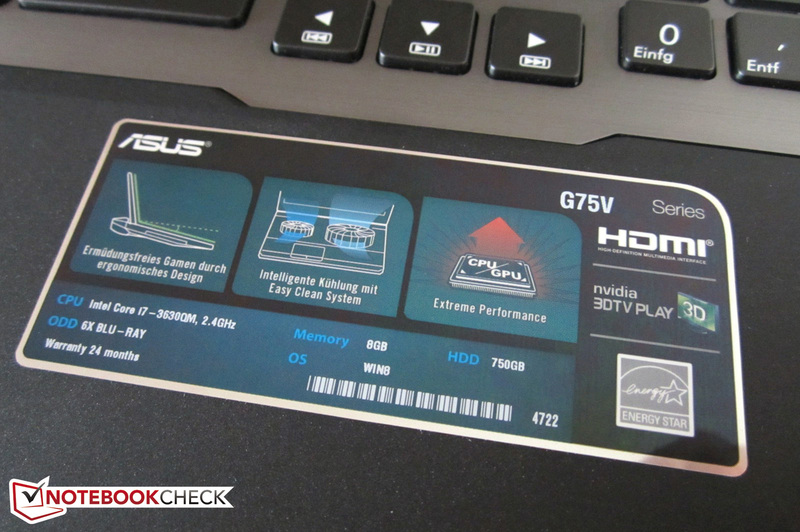 Due to the omitted graphics switching, the G75VX consumes more power in idle use than other high-end laptops. 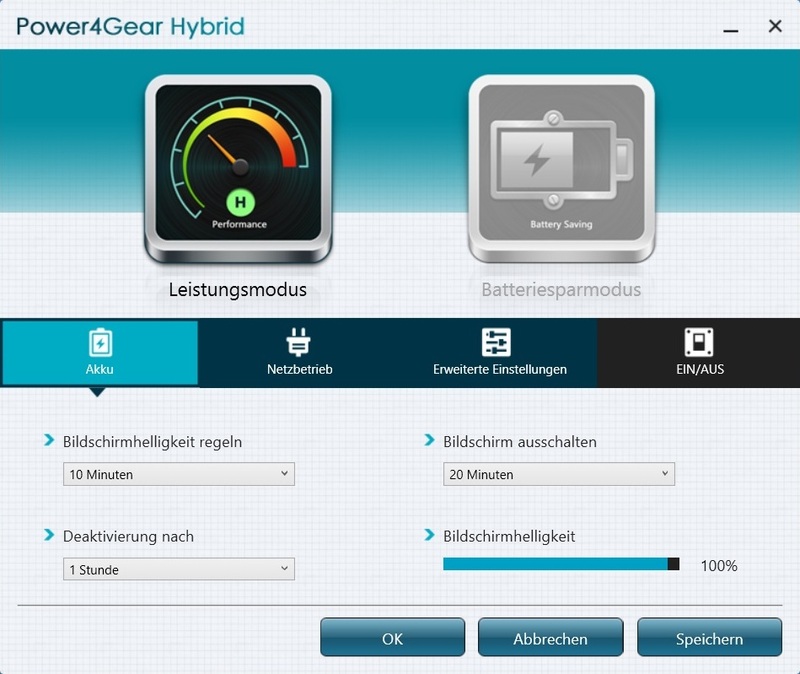 However, the power consumption of 15-27 Watts is much lower than that of the former G75VW (21-35 Watts). A similar picture is seen in higher load. The new model is about 25% more economic in 3DMark 06 (82 vs. 108 Watts). The difference is even 50 Watts during full load (138 vs. 187 Watts). To make it short: The Kepler architecture extracts roughly 30-60 minutes more runtime from the battery. The G75VX lasted for almost five hours in the Battery Eaters Reader's test, which we perform using the minimum brightness level. The G75VW only managed about four hours. The runtime of 3 vs. 2.5 hours in wireless Internet browsing is also noticeably longer. The 17-incher now played a DVD for 2.5 hours rather than two hours. The Battery Eater's Classic test (maximum brightness) did not exhibit any major difference: 70 - 80 minutes are rather ordinary. 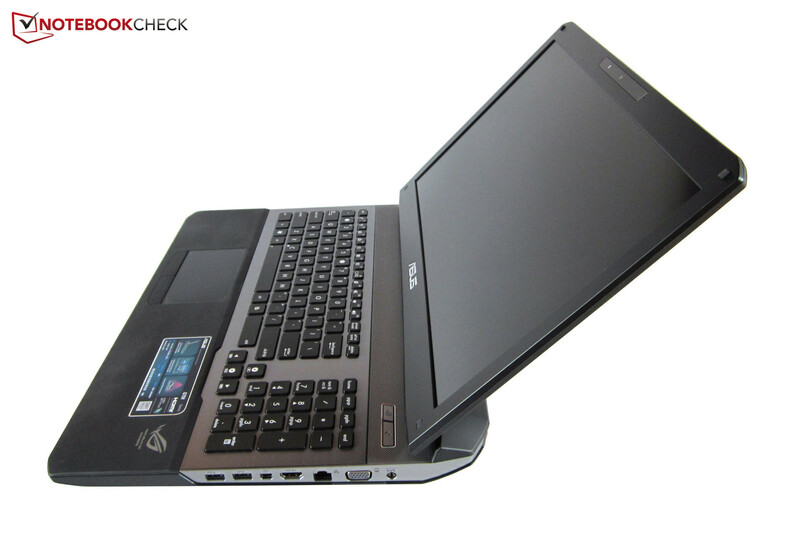 Although the gaming performance and the AUO screen are a step back, we would recommend the new G75 model. Compared with the G75VW, the G75VX is not only cooler and more energy-efficient, but also bids longer battery runtimes. Nvidia has done a great job with the Kepler architecture. The GeForce GTX 670MX proves to be a well-designed premium graphics card that represents a good compromise of power consumption, speed and waste heat - despite its moderate future prospects. Intel's Ivy Bridge generation reaped in enough praise in the past. 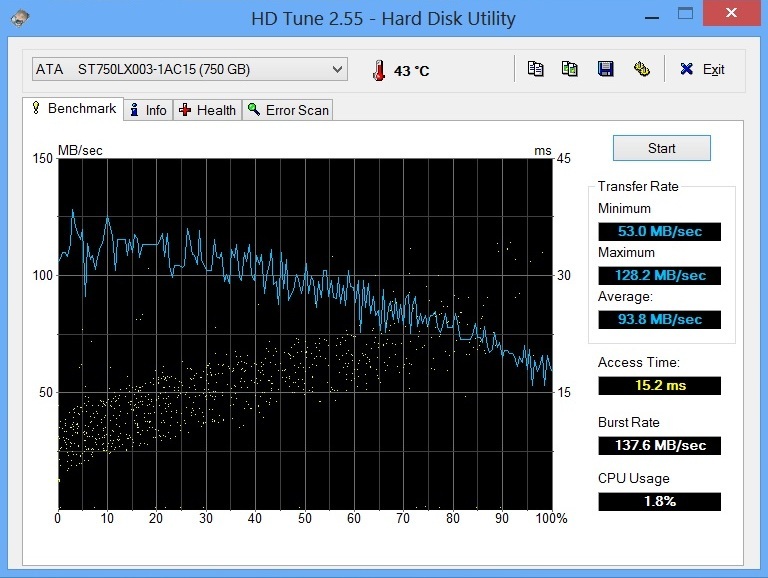 The fast hybrid hard disk is another bonus point. 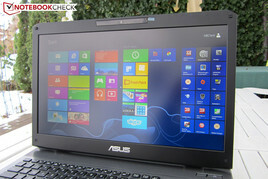 However, the laptop is especially convincing outside its pure performance. For example, its high-quality and well-crafted casing would be named here. 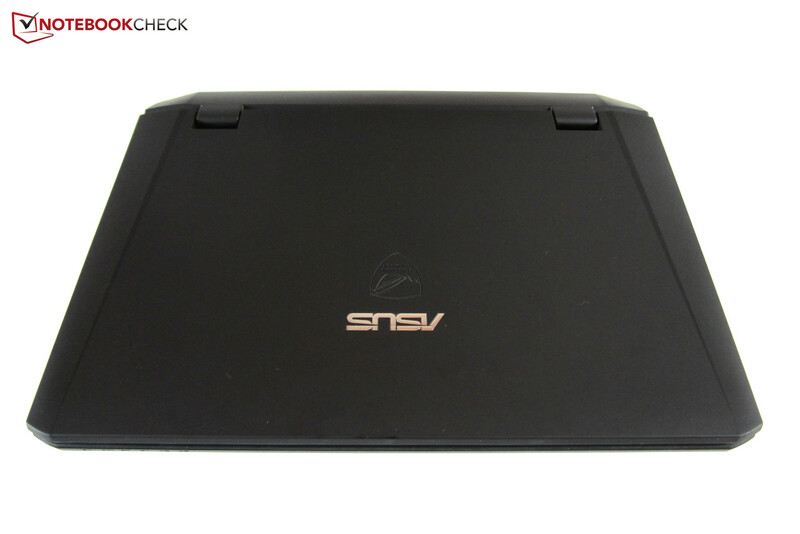 The rubberized lid and metal keyboard tray convey a good quality impression. Owing to the backlight, the device can even be used at night without problems. The potent cooling construction has a negative effect on weight and dimensions, but in return, it ensures a moderate noise development. The matte Full HD screen only scores with its brightness. Viewing angles, black value and contrast are not worthy of reference. The omitted graphics switching also prevents a higher rating. Overall, we deem the G75VX to nevertheless be a balanced total package. 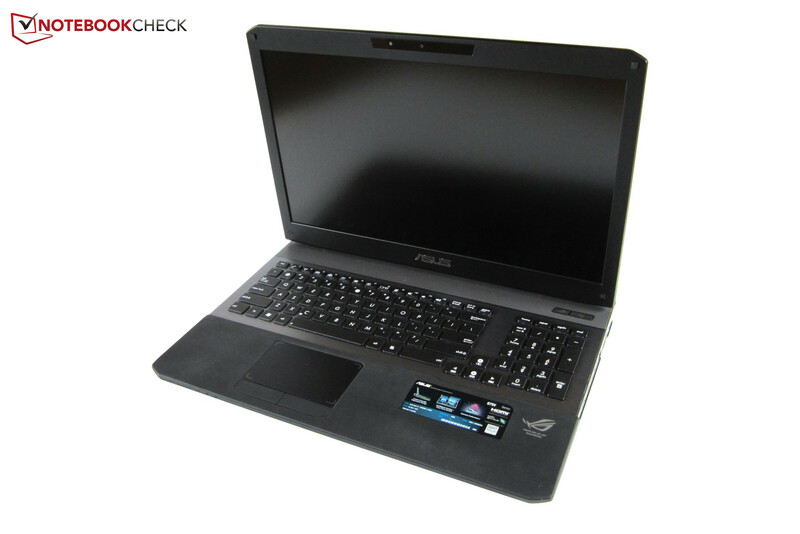 Quality-oriented gamers can buy without hesitating. The empty RAM slots can be accessed via the casing's bottom. 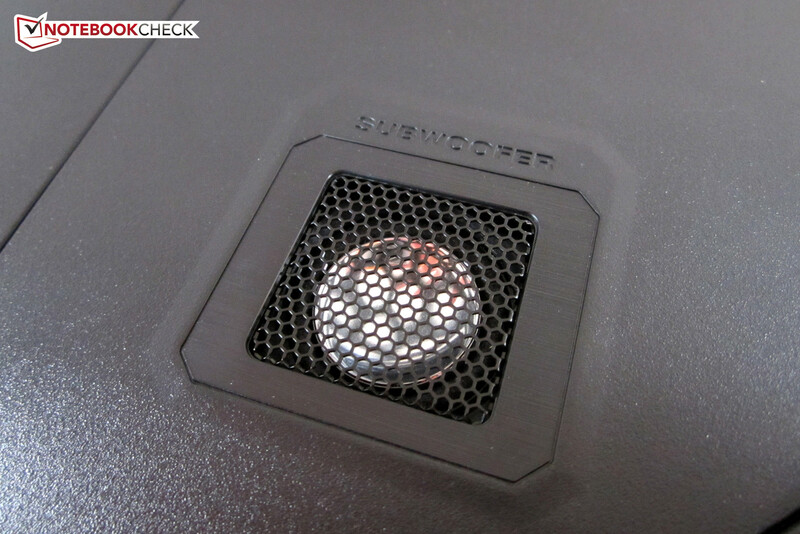 A subwoofer enhances the sound experience. The 8 cell battery supplies 74 Wh. The webcam is of course in the display bezel. The G75VX definitely belongs to the best gaming laptops. The power button is lined by a fine grid. This is the American keyboard unit. 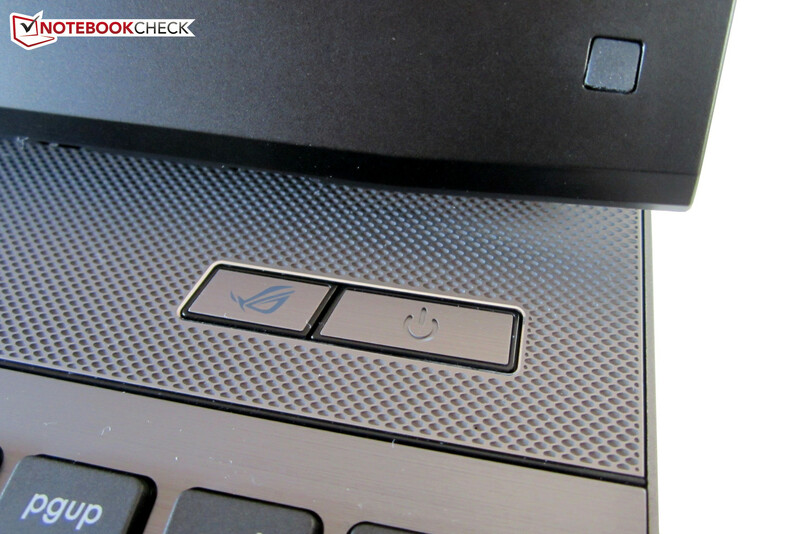 Asus gives the arrow keys plenty of room. Owing to the clever cooling, the chassis does not get hot during load. The noise development is kept within limits. 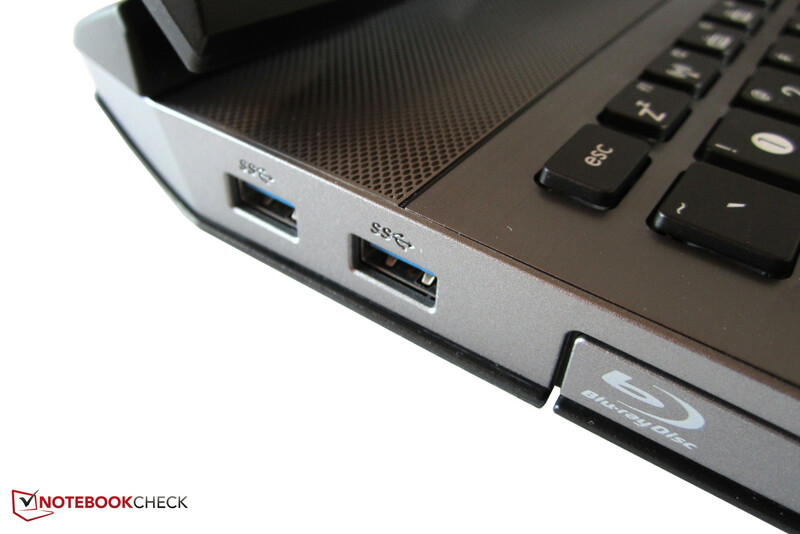 Two fast USB 3.0 ports are located beside the Blu-Ray drive. Asus places most interfaces on the right. Two audio sockets are a bit skimpy. The new PSU surprises with a slim build. The manufacturer uses an in-house design for the graphics card. A second hard disk can be inserted without problems. It is not easy to access the processor. most pictures we used are from the previous review. The lid scores with an elegant rubber coating. The workmanship is on a high standard. Convenient: the maintenance cover only has one screw. The desktop replacement weighs almost 4.2 kilograms with the battery. The maximum opening angle is rather moderate (~130°). The G75VX is relatively big for a 17 incher. The Full HD screen hardly shows reflections. 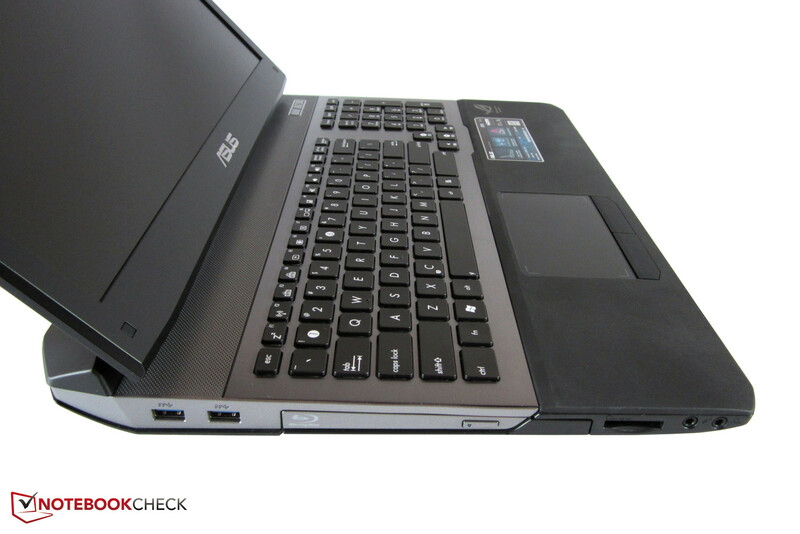 Asus only uses matte surfaces. High-quality metal is used for the keyboard tray. The maintenance options are not outstanding. The fan outlets are in the rear. The silver elements create a nice contrast. The chassis proves to be quite resistant. The laptop stands stably even without the battery. 180 watts don't even come close to being exhausted. The casing's matte and awesomely cool surfaces. Not all components can be accessed directly. 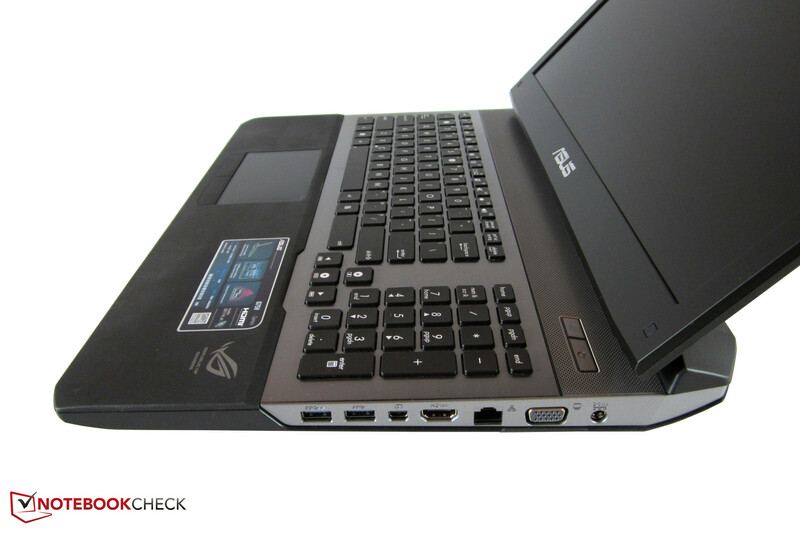 Asus still does not use Nvidia's Optimus technology. 17 inch desktop replacements featuring high-end graphics cards, such as Alienware's M17x R4, Deviltech's HellMachine, MSI's GT70, Medion's Erazer X7817, One's M73-2N, Samsung's 700G7C, Schenker's XMG P702 or Toshiba's Qosmio X870.